But those were just the two standouts. Dishonored 2 was full of groundbreaking levels. Death of the Outsider? Not so much. The bank is also a self-contained area, which I think is important. 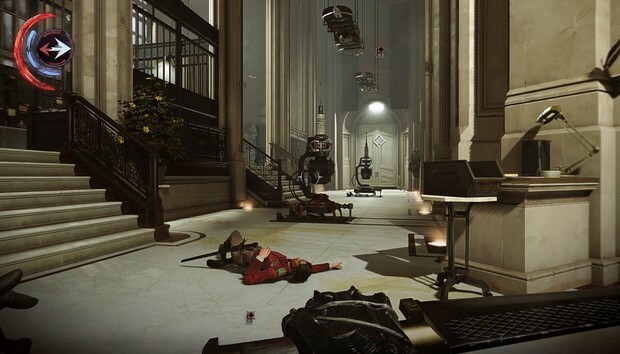 While I love some of the wide-open levels in Dishonored 2, I think the series is best when the player is constrained—when the space is an elaborately-constructed puzzle. 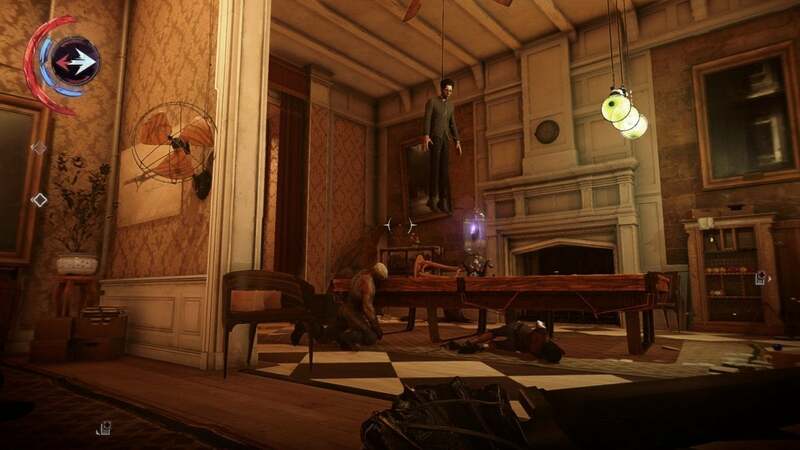 The Clockwork Mansion fits that bill, as does Stilton’s manor, as does Death of the Outsider’s bank. So yeah, a high note. The fifth and final mission also wins points for aesthetic—it’s very different from business-as-usual Dishonored. You’ll see. But too much of Death of the Outsider feels rote. The first mission is notable only because you don’t yet have any supernatural powers, but is otherwise standard Dishonored. The second is one of those wide-open areas, and feels like playing the Dust District again. The third mission, pre-bank robbery, actually uses the same open hub as the second mission—frustrating because completionists will have to backtrack through and rob the same handful of apartments again for no real reason. It would’ve been better if the bank mission had been truly self-contained. 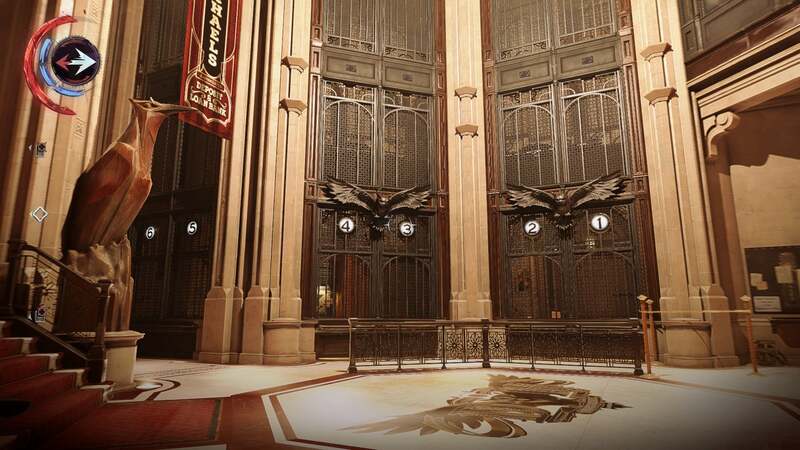 The fourth mission is just a rework of the Royal Conservatory level from Dishonored 2, post-witches. No, really, it’s the same building, but with the interior changed to reflect events in the previous game. And then there’s the fifth level, which is at least more interesting to look at but not groundbreaking to play. None of it is bad, but coming off Dishonored 2 it feels like a letdown. Even a mediocre Dishonored is still a solid stealth experience, but this isn’t like BioShock 2's Minerva’s Den (or even Knife of Dunwall, the expansion for the original Dishonored) where it felt like it added a lot to the base game and was, in some ways, an even better experience. Dishonored 2 is the high-water mark here, and Death of the Outsider very much an add-on. That goes for the story, too. 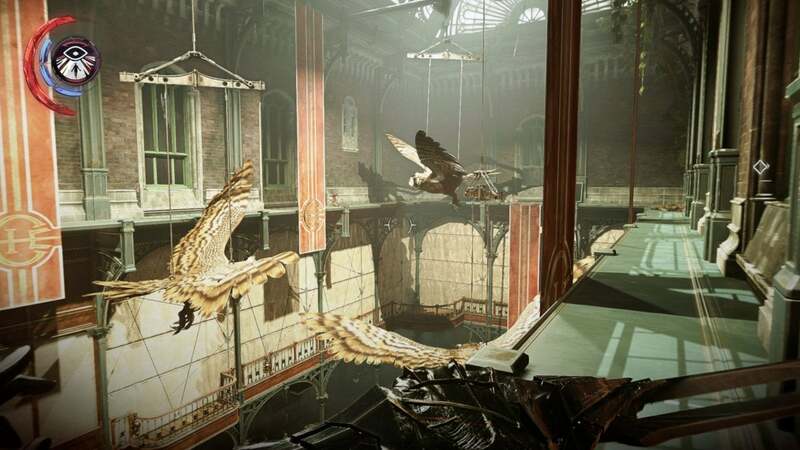 I wasn’t a huge fan of Dishonored 2’s story, and was hopeful here. The title Death of the Outsider is certainly an attention grabber, and “killing a demigod” sounded like far better stakes than Dishonored 2 proper, which was basically a rehash of the original game’s royal family woes but set in the Caribbean. Death of the Outsider doesn’t make much of its conceit, though. 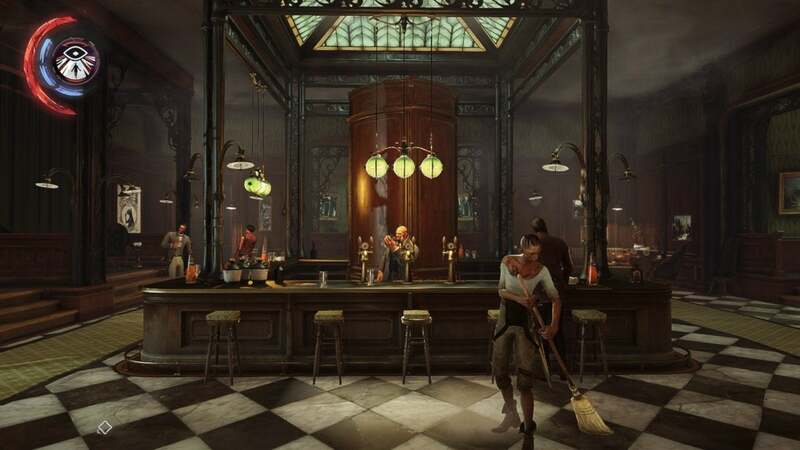 There are some intriguing moments, a few bits of lore that will appeal to longtime fans, and potential ramifications to either ending that could make a Dishonored 3 very interesting indeed. Billie Lurk’s story doesn’t go much of anywhere though, Daud barely moves the needle, and the ending feels entirely unearned. Both endings, actually. Despite starting strong, the player is eventually rushed to an inevitable conclusion without any motivation given, and were it not for the fact it’s titled Death of the Outsider you might be forgiven for thinking the whole plan is absurd. There’s no “Why” to any of it. Daud decides to kill the Outsider for the thinnest of reasons, Billie agrees because the title expects her to agree, and we’re left with plot holes you could pilot a whale through. In short: Dishonored continues to have one of the most interesting worlds of any video game series going, and continues to squander that world on some of the most insipid story lines. Two final bits to discuss before we wrap up: Billie’s powers and Contracts. Powers, first. I’ll say this: I still think Corvo’s set of powers are my favorite, but Billie’s grew on me as I played. You have the mandatory Blink alternative, here called “Displace,” which allows you to mark a spot first and then teleport to it whenever. At first it just seems like a slower Blink, but there are some tricks to it. You can, for instance, teleport into someone else, which causes the other person to explode. Hilarious, albeit useless to pacifists. Displace is better when used alongside Foresight, another Billie power. Foresight allows you to freeze time and become a ghost, basically—you can float up and down, float through grates, float through windows, et cetera. Your ghost can then set up Displace markers also, so you can, for instance, float through an iron grate, put a Displace marker on the other side, and then teleport through the grate. That’s the big improvement over Blink. But the last power is probably my favorite. Semblance allows you to impersonate any character you knock out. I enjoyed borrowing a guard captain’s face, then forcing lower-rank guards to salute me before punching them in the throat and knocking them out. You can also impersonate named characters, allowing you to, for instance, steal the identity of a famous singer and use it to crack a certain "impenetrable" safe. It’s the most creative of all the new powers, and is definitely up there with Domino for my all-time Dishonored favorites. Also: There are no more mana potions, which means you’ll actually use these weirder powers more often. Excellent change. Now, Contracts. I briefly talked about these during my impressions but to reiterate, they’re secondary objectives littered throughout each mission. One asks you to crack a certain safe, another might ask you to infiltrate the bank and leave without anyone noticing your presence, and so on. It’s a great idea and brings a lot to those larger missions especially, giving players more reason to stray from the path and investigate apartments, take out every person in a certain bar, and so on. I’m still annoyed, though, after finishing, that these Contracts don’t facilitate the usual Lethal/Non-lethal blend Dishonored is known for. There are a notable number of contracts that straight-up ask you to murder characters. 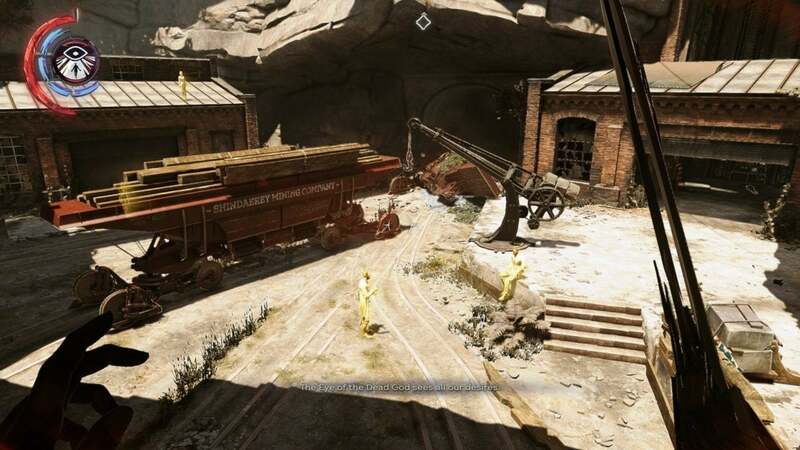 Despite the fact there’s no High/Low Chaos system in Death of the Outsider it’s a bit strange to me still that players are railroaded into murder. Not my style. Anyway, you'll find some decent ideas in Death of the Outsider. It’s also surprisingly long: I clocked 12 hours playing stealthily, though I’m sure you could move through it in half the time if you preferred to just run into rooms and stab everything that moves. Death of the Outsider doesn’t completely gel, though, and I’m left feeling ambivalent. The setup is excellent, but the story goes off the rails within the first three missions and never recovers. The new levels are fine but feel like retreads of Dishonored past (one mission is a retread of Dishonored 2), and then it rushes to a lackluster ending. 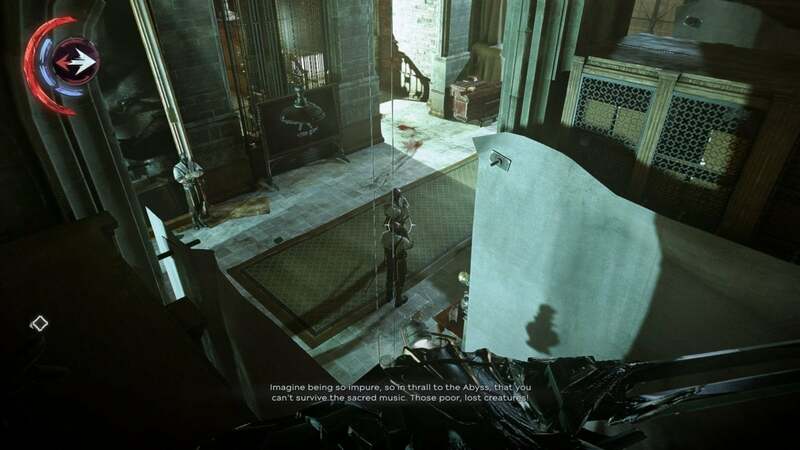 As I said earlier, even a mediocre Dishonored is still a decent-enough stealth experience. Considering Death of the Outsider is a follow-up to one of the all-time great stealth games, though? It's forgettable, at best.